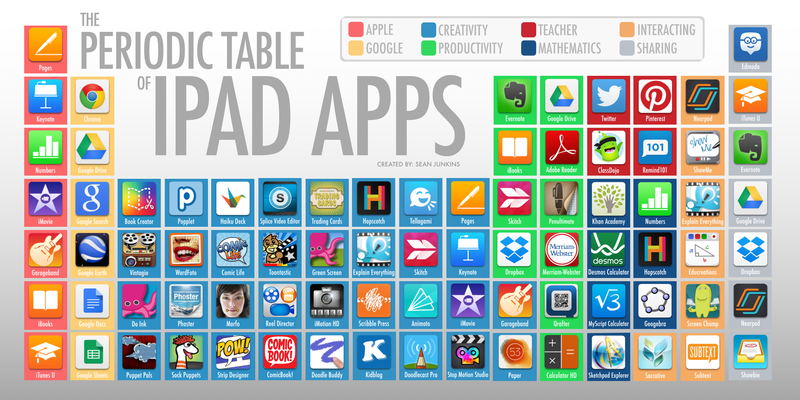 Earlier this week, I saw a tweet showing a compilation of apps entitled the Periodic Table of iPad apps (https://sjunkins.files.wordpress.com/2014/06/iste-posters-001.jpg). I thought that the poster was quite creative and was impressed that the creator (Sean Junkins, @sjunkins) followed a key feature of the periodic table of elements and categorized everything into different groups. The categories include Apple, Google, Creativity, Productivity, Teacher, Mathematics, Interacting, and Sharing. As an iPad user in the classroom, I have used several of the apps listed and many science related iPad apps, as well. I have also been asked at times, by several other iPad users, to share my list of science related apps. I would like to hear from you to find out which science related apps you have used and found beneficial in your classroom. With your suggestions, I plan to update my current list and then post for everyone.